The Grand Council of Royal and Select Masters of England and Wales etc, was formally constituted on 29 July 1873 by four Councils chartered just two years earlier by the Grand Council of New York. They organized themselves into a sovereign body under the patronage of the Rev Canon G. R. Portal, Past Grand Master of the Grand Lodge of Mark Master Masons, who was installed as the Grand Master of the Order. This Grand Council had its vicissitudes but continues to prosper and today has many Councils overseas which are controlled by District Grand Councils. The degrees in this group are frequently referred to as ‘Cryptic Degrees’ but this description is not strictly correct, as only two actually refer to a crypt. It is somewhat surprising to note that to many, these ceremonies constitute nothing more than interesting side degrees or a random collection of unrelated incidents in the story of King Solomon's Temple, but to the serious and understanding masonic student, they prove to be the essential link between the degrees of Master Mason and Royal Arch Mason. Royal Master. This degree is set in time just prior to the completion and dedication of the first Temple; it highlights the completed vessels pertaining to the House of the Lord and refers to a certain fellow craft making diligent enquiry of HA as to when he might receive the secrets of a MM. The subsequent disquisition by our Grand Master on the subject of death is one of the most enthralling pieces of ritual in freemasonry. It also shows how the secrets came to be deposited in the crypt where they were subsequently found. The symbolic colors are black and red. Most Excellent Master. This degree deals with the completion and dedication of the first Temple; it celebrates the completion of the whole edifice and mentions the installation of the Ark of the Covenant in the Holy Place. It constitutes a fitting ceremonial and dramatic preface to the Cryptic Degrees. The symbolic color of the degree is purple. Super-Excellent Master. The legend around which this degree is built brings the story of’ the first Temple down to the time of its imminent destruction and refers to the siege of Jerusalem by the troops of the enraged Nebuchadnezzar, following the rebellion of the tributary Jewish king, Zedekiah. The symbolic color of the degree is crimson. Besides these degrees, there is also a Ceremony for the installation of a Master of the Council. Since January 24th 1990 this order has a 'Council' in the Netherlands: the Council The Netherlands, number 163. The number of members of this council is not known. The Dutch Grand Orient has allowed this Council upon the condition that this type of freemasonry is not to be spread in the near future by the founding of new councils. The RSM are open for freemasons that are Mark master masons and Royal Arch Masons. 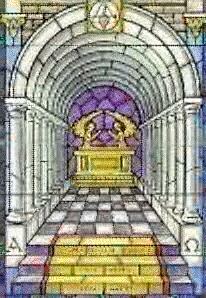 On the CD-Rom York Rite Library we have published more rituals and other texts of this order.